Hamilton literally looked up to the skies for design inspiration for the new Khaki BASE Jump watches. These robust timepieces may not have a ripcord, but their appearance visually recreates the adrenalin-filled spirit of BASE jumping (jumping with an unopened parachute from a Building, Antenna, Span or the Earth). There is an automatic version containing a 2824 ETA-movement, as well as a sophisticated automatic chronograph with a 7750 movement. With their bold 50 mm cases and rugged color scheme, the Khaki BASE Jump timepieces give wearers wings when it comes to style. A unique feature of the Khaki BASE Jump Auto Chrono is the chronograph functionality activated via the turning bezel. The Khaki BASE Jump Automatic version also integrates a turning bezel, in this case for an original bi-directional countdown. Both watches use a typeface of the sort commonly found on ‘classified information’ files, ensuring that the looks signal dynamic operation possibilities. The robust character is highlighted by a protected crown, positioned on the left-hand side of the watch for easy use in extreme situations, and an easy-grip finish on the bezel’s outer edge. Just like the sport that inspired the watch’s name, the Khaki BASE Jump timepieces have precision at the top of their checklist. 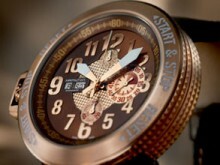 An eye for design detail complements the quality of the Swiss movements. The dimensions of the case commensurate to the parachute are contrasted provocatively and stylishly with a ‘Clous de Paris’ pattern. The chronograph model comes with a choice of a titanium case with a black finish, or a stainless steel case coated in black or brown with matched dials. 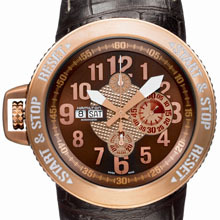 All versions have rubber straps to match the dial and underline the edgy, sporty statement. 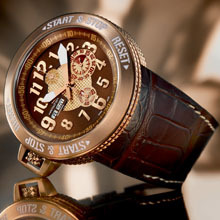 The non-chronograph interpretation has identical color combinations and a stainless steel case. In all of its declinations, the Hamilton Khaki BASE Jump promises to become as iconic as Icarus - hopefully bringing their wearer more luck in high-flying activities. BASE jumping is an activity using a parachute to jump from fixed objects, with the parachute remaining unopened at the start of the jump. BASE stands for the four recognized categories of fixed objects from which BASE jumpers can jump – Building, Antenna, Span (a section between two intermediate support and earthen objects such as a bridge) and the Earth. Providing a further link with Hamilton, the acronym "BASE" was coined by film-maker Carl Boenish. He was the real catalyst behind modern BASE jumping and in 1978 filmed the first BASE jumps (from El Capitan in Yosemite National Park).